WILLEMSTAD - It is not yet clear how much garbage was picked up by the Curacao cleanup last Saturday. The last trash containers will be weighed today by the waste company Selikor. The number of volunteers that participated in the clean-up was about two thousand people. There were about 600 children and 177 divers. More than 30 locations were cleaned. 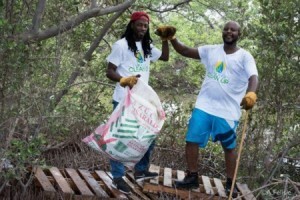 According to the organization, the last edition was a great success and in some locations, there was less trash compared to last time they did the clean-up.